We are thrilled to be hosting our third blog hop at Daydream Designs. Our theme is hearts... and other than that it's anything goes! So you will see lots of variety and the tremendous talents of our Dream Team. 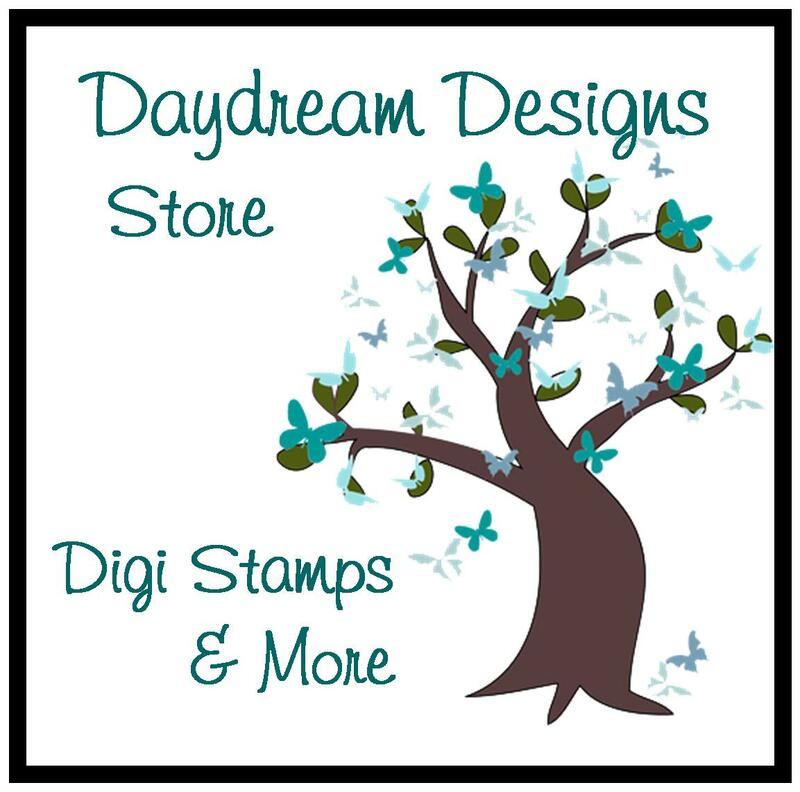 To Win: Just leave a comment at each one of our Dream Team Member's Blogs listed below. 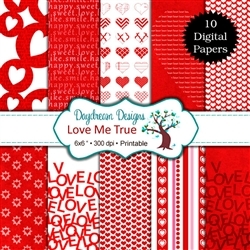 Supplies: Love Me True Digi Papers, Ticket to Bliss Color Digi Set, Love Me True Digi Paper Pack, all from Daydream Designs; Recollections Black Pearls; Recollections Black Rhinestone Swirl; Prima Black flowers; Misc flower brad; DCWV red and black cardstock. Supplies: Love Lifts You Color Digi Set from Daydream Designs; Pink and Brown DCWV cardstock; Memory Box Twirled Heart Border; Misc heart brads. Enjoy the freebies and take the time to comment at all the participating blogs for your chance at that $20 gift certificate! these are darling cards. LOVE those Bingo cards. so so cute! gorgeous cards Jenn they are both so pretty it would be hard to pick a favorite. Wow, so pretty! It's it great to be able to use those ticket images. It makes it so easy to put a project together. I love the color combo on your balloon card. Both of these are gorgeous!! The black flower and bling make the first one really pop! 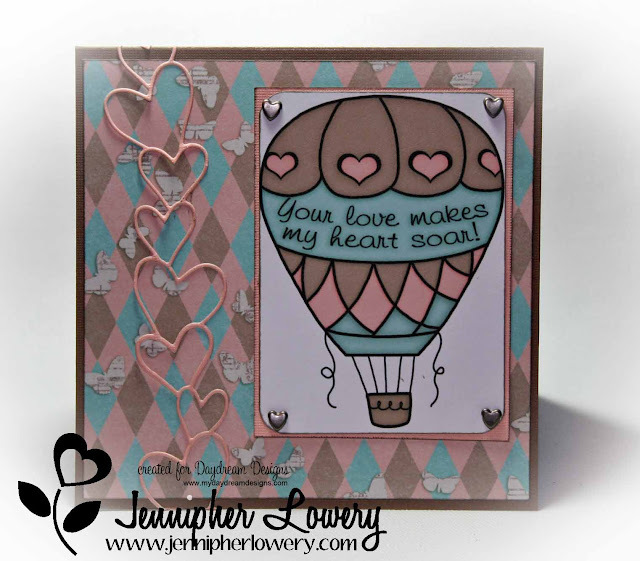 I love the colors and the heart die on the balloon card! Oh, my goodness, Jenn! These are both stunning creations. Love the tie in from the sweet heart bingo cards to the tickets. Clever! Such pretty embellies on that card too. And totally love your balloon card. I definitely think you've found your digi style, gf!! Such a cute card. That little heart border is amazing with the card too. 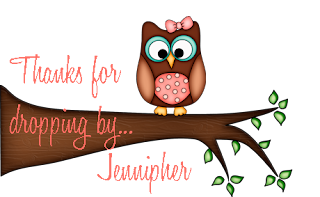 Thank you so much for joining the blog hop. I'm so blessed that you are a part of the Dream Team! Jenn, what great cards. 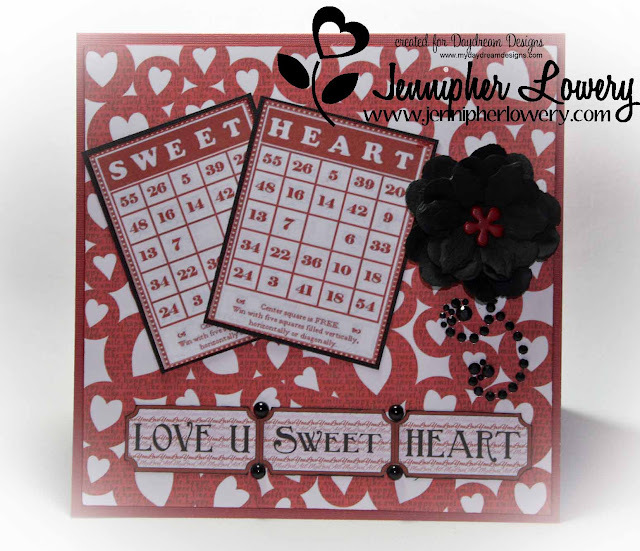 I really like how you have the tickets saying SWEET HEART to match the bingo cards. They are stunning with the bling. I love how you have the hearts going up the side on your other card. The vertical hearts went really well with the balloon image to give the look of movement. Awesome job!! Your cards adorable Jenn. I love the sentiments on the tickets. Thank you for the wonderful inspiration! 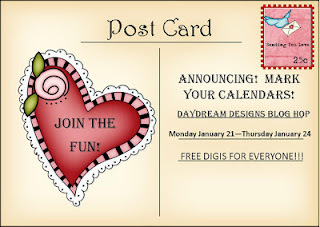 I am loving the blog hop, keep up the great work ladies! 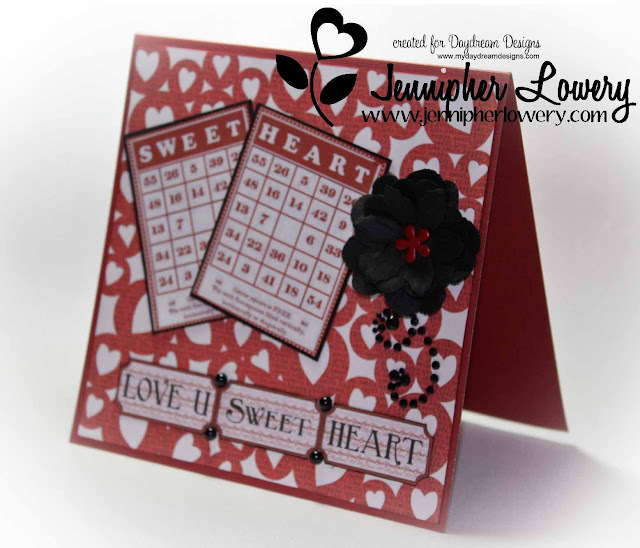 Adorable cards, love all the hearts and color schemes. Hi Jenn! WOWIE, loving your cards so much. Very sweet, that first one makes my heart melt and your 2nd is beautiful as well! Love that Memory box heart border you added. Now I get to feel a li'l bit of what Diane experiences every week when others create with her digis. LOVE!! 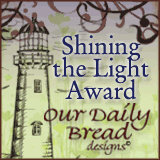 Thanks for all the inspiration ~ have a wonderful week! Just lovely as always, jennipher. I'm so blessed by everyone's creations for the hop. Have a blessed week. I love how detailed and different these cards are! The jewels, tickets, bingo cards and flower are terrific. And that hot-air balloon and hearts are lovely. Jenn, these are so very cute cards!! Great combination of digitals and I love what you did with Kris's new set as well!! 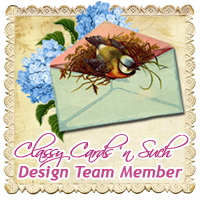 Beautiful designs!! Wow, both are lovely! 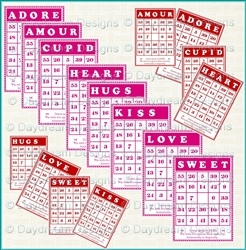 The bingo cards are so fun and love the sentiment at the tops of them. Your colors on the Love Lift me Up card are so soft and pretty and love that die with it! Thanks for sharing....having a wonderful time hopping. Can't decide...both cards are gorgeous! 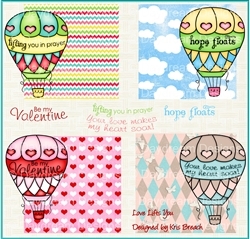 The colours in bingo card is so soothing...and the hot-air balloon cardis just sooo much fun! My favorite of the two is the balloon, the colors are just so soft. The are both delightful cards though. OMG! These are fantastic! I love both of them. They have very different looks but are both wonderful! Great job! Gorgeous Valentine's Day cards Jennipher! The first one with the bingo cards is my favorite. 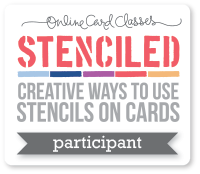 Really neat cards you have created for your portion of the blog hop. Thanks for sharing. BTW I love the spelling of your name. Did you hate it being different when you were growing up or did you revel in its uniqueness? Kudos to your parents on their creativity. Love your colour choices and especially the delicate hearts in the 2nd card. Beautiful! Love both of these Valentines, Jenn! That pink open heart border on the 2nd one is awesome! 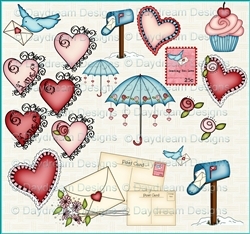 Oh my - these are fantastic - lovin that heart border - perfect! 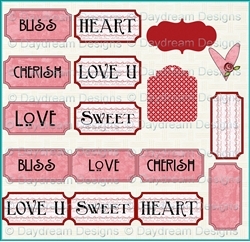 These are both beautiful and I love your heart border die, looks so very pretty and delicate. These two cards are fantastic! I especially like the hot air balloons on the 2nd one. Great use of the bingo cards on the first one -- bingo cards seem to be a challenge to me. Great job!! Hi Jennipher! Both cards turned out beautifully! I especially like the red & white one with the Bingo cards! I never know what to do with them...you've placed them perfectly. And the black flower...so romantic! Awesome cards Jennipher! I just love those Bingo cards. BTW, thanks for the encouraging post you left me and yes, we can do what we need to do for our health! We are strong women. You are in my prayers daily. The first card is absolutely stunning. Black is such a great enhancer of beauty. The pastels on the hot air baloon elaborate the whimsy. Love your cards Jennipher. 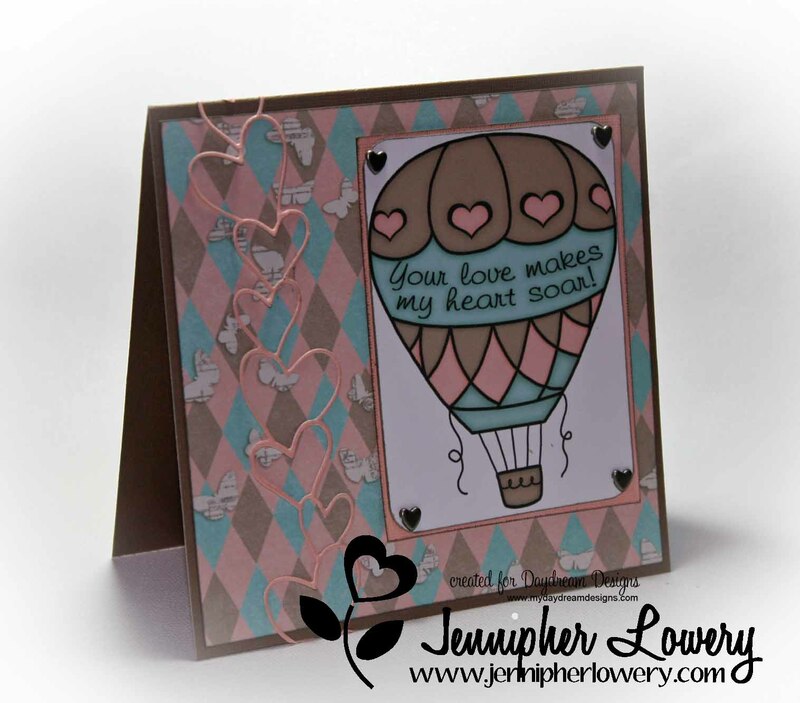 I especially like the hot air balloon card. Love the soft colors and all the hearts. These are so beautiful! I love the bingo cards!! Both cards are stunning! The tickets and bingo cards look so perfect together, and I'm loving the colors on the hot air balloon card! 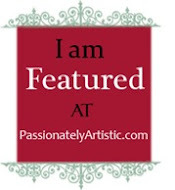 Yayyyyyy Jennipher, I finally made it to your blog. I knew I would love it, and am so glad that I got here. Your creations are totally awesome, and your blog is just too adorable! !